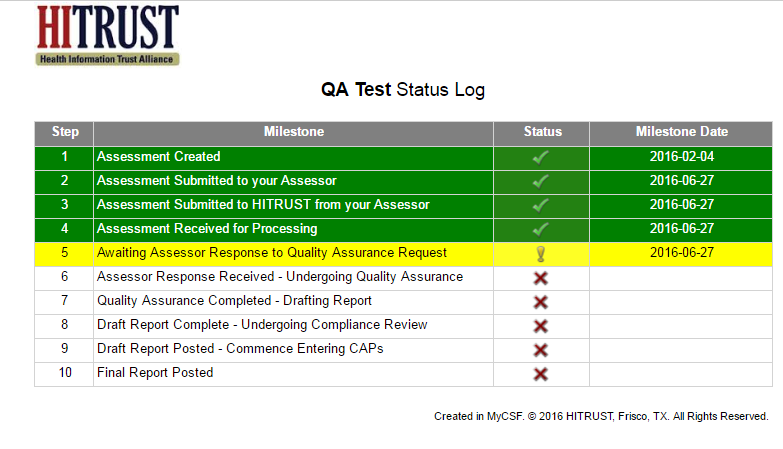 The Detailed Assessment Tracking feature provides real-time insight into the status of Validated HITRUST CSF Assessments. Managed automatically by MyCSF, your Assessment’s status history can be found by going to the Assessment Homepage for an Object and scrolling down to the Action button. Pressing this label will reveal options relevant to the phase of the Assessment. Click Assessment Log History and a thorough report of the past, present, and future milestones will be revealed.